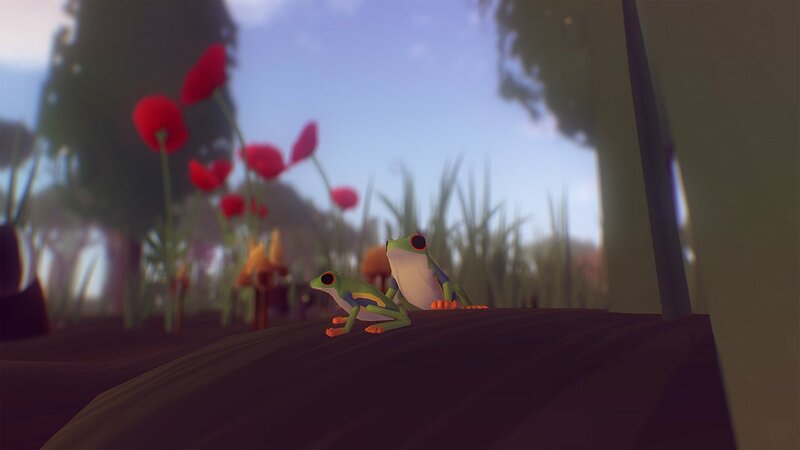 Everything is a game about, well, everything. A universe of interconnected lifeforms, from cosmological constructs to the smallest of subatomic particles. Each and every object has a mind, and every mind is filled with thoughts. A flower muses that repetition is its only form of expression. A planet ponders on a notion that could be summed up as, “Does my bum look big in this?” It is an unashamedly weird and wonderful game that mixes questions of existential crisis and pedestrian philosophy with a truly open-plan approach to exploration and interpretation. So what exactly is Everything? Well, we could say it’s whatever you want it to be, but we can already see your eyes rolling back into your skull with a sigh, so we won’t be so pretentious. The best way to describe it is a walking simulator where every single object and being in the universe is a playable character. Something as small as an atom to something as vast in scope as a galaxy can be played, with their various thoughts and ideas serving as a form of collectible. Every time you interact with a new being you collect their thoughts into a giant matrix you’ll eventually need to utilise later on. 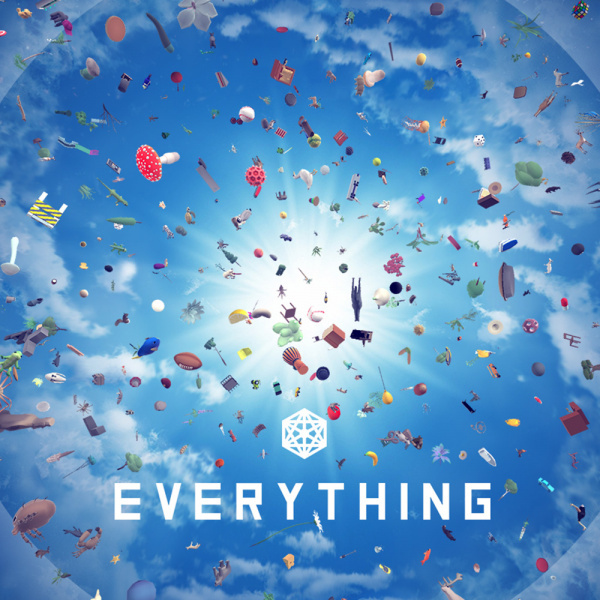 That is Everything in a nutshell – or as tidy a nutshell as it’s possible to fit an entire universe into, that is – but trying to categorise a game like this is kind of missing the point. It falls into the same floaty, abstract art-piece territory as Proteus or EGO, where you’re just meant to pick up your Joy-Con, explore and accept (or dismiss) everything you see. As a result, this is the kind of game that’s going to elicit very different feelings from players. Some will find its cosmic curiosity enchanting, while others will likely be nonplussed by the sheer absence of concrete direction. Everything, by default, is both wonderful and disappointing all at once. Both beautiful and ugly. 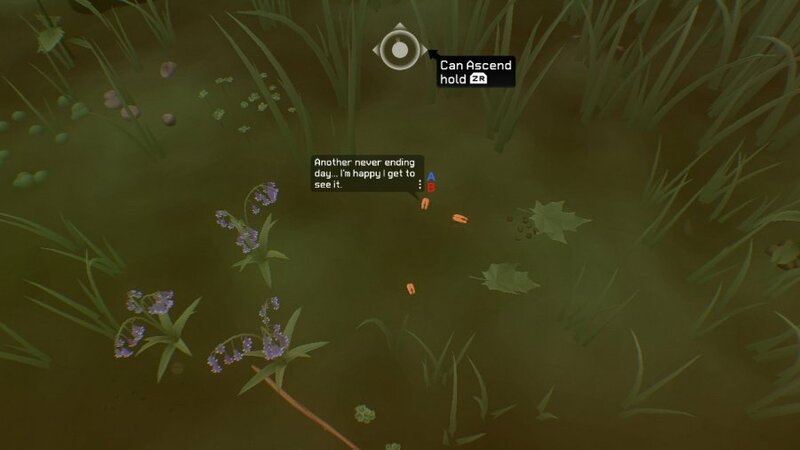 A Schrodinger's Cat of game design that’s exceedingly clever in how it mixes handmade settings and procedural generation into an experience that’s all its own. What other game enables you to 'descend' to a subatomic level or 'ascend' into the unimaginable breadth of space? With sound bites of late British philosopher Alan Watts peppered throughout, Everything often plays like one grand experiment in spiritual thinking and a god simulator that lets ants sing to bears. It's bizarre in an almost Katamari Damacy sort of way; a form of surrealism that’s spent far too long rewatching Cosmos: A Spacetime Odyssey. In your first hour, you’ll slowly be introduced to the basic principles of the game’s mechanics. Any being or object can be possessed or inhabited and you can sing to them by holding in the right analog stick. Singing to objects of the same or similar type will enable you to determine exactly what you are, which in turn adds it to growing list of creatures in the pause menu. You can enter Flock mode by holding ‘Y’ and create a whole herd of creatures, or press ‘A’ to listen to any random thoughts that you encounter. Every so often, the abstract symbol at the top of the screen used as a compass of sorts will glow, which will enable you to have a thought based on all the things you’ve seen so far. Moving from the cosmological to the infinitesimal is as simple as holding ‘ZL’ and ‘ZR’. You go as low as a subatomic particle then keep ascending through the tiers to a giant galaxy. 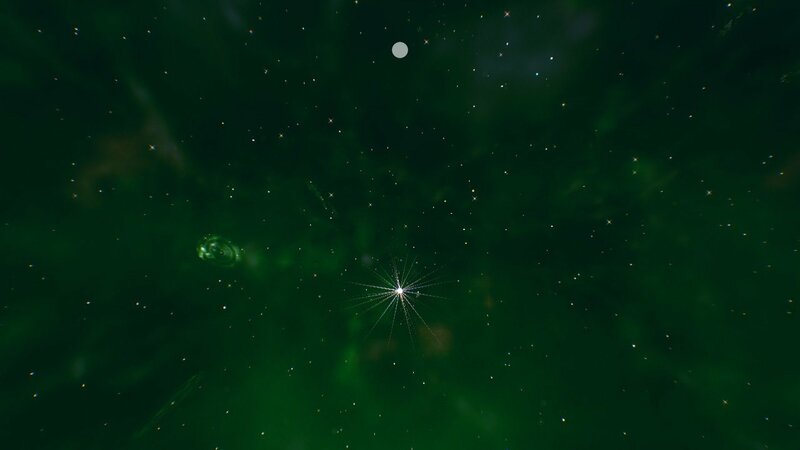 There’s an almost No Man’s Sky quality to zooming around space as a green, Earth-like planet before encountering an alien planetoid and flitting through its ecosystem of life. You’ll encounter alien trees and reptiles, control extraterrestrial continents and everything in between. You’re a chronicler of sorts, gradually cataloguing the life of the universe on your travels. The excerpts of Watts’ speeches – taken from some of his most famous seminars in the ’60s and ’70s – help give Everything a meditative quality as you slowly move through the depths of space listening to the thoughts of morose asteroids or zooming through the air as a leaf, only to brush past a particularly unfriendly stalk of barley. As someone who extolled the principles of Eastern philosophy – including The Way of Zen – Watts' existentialism becomes one of the game’s most important features. Like a director’s commentary, you gradually unlock more the longer you explore a set. Everything even has an auto roam mode that will see it take back the reins and explore the universe on its own, collecting thoughts and stories for you. It's such a strange game for sure, but one that simply hopes you might ponder the universe around you as a result. 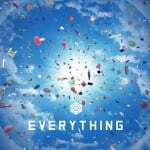 Everything really does deliver on its abstract concept, but only if you’re willing to boot it up with an open mind. There’s no action, or even a cohesive plot. There are no XP bars to fill or loot to collect – just a universe and you, and a desire to determine just who ‘you’ really are. The basic textures and colours (and the hilarious way creatures just roll about like possessed statues) might stifle some, but Everything’s worth is more than skin deep. It’s a risky game – some will love it and some just won’t get it at all – but it’s an experience well worth undertaking, regardless of where you end up. I've always wanted to play a game about an incoherent jumble of stuff. This sounds interesting and at the very least different. Brave and interesting, I certainly applaud the creativity and risk they have taken to create something so singularnand new. Will I buy it? Mmmmm.....tbh, the visuals are putting me off. A game like this needs to be beautiful, at least to my mind. Then again, I do like a relaxing experience, a break from Mario, Wolfenstein etc., so maybe I’ll be tempted. Always had a thing for this game. I love the concept of scaling this much, from atom to galaxy. I feel like this is a game that I'll need to watch a bit of gameplay of to get a gauge of it. I don't think it's for me though. On a serious note, I've watched quite a few gameplay videos of this on YouTube, and I'm officially adding it to my wishlist. The game is just so random, and for some reason I'm finding that appealing. Seems like a good game to just chill and mess around in. @Spectra NO THING came out a while ago, this is a different game. Another review mentioned several crashes and other mishaps, did you have those? I guess a few people will buy that on the name alone, just to make the joke "I can run Everything on my Switch!". Waiting for a sale... this isn’t a game. And it’s Ok.
@SmaggTheSmug Or "I just bought Everything on the eShop for under $20!!!" @SenseiDje Looking for those audio logs can be taken as game-like. "It's such a strange game" is also what the 'Vroom in the night sky' - trailer said about that game. Not sure if that's a good thing. Probably gonna buy the game purely for the philosophical meaning behind it. I will be picking this up tonight, looks intriguing and completely beautiful. @Mando44646 no preorder discount as it's already released (in the UK). It's only £11.?? so hopefully money well spend to explore everything. As mentioned by @nagash this game was made by experimental animator David O’ Reilly, who’s pretty famous in the animation world for his style and experimentation. He even directed an episode of Adventure Time (that seemed to confuse the fan base quite a bit 😏). Being a fan of his I downloaded the game immediately, and was at first a bit underwhelmed, but the game was a good, long, slow burn. At one point I put it on autoplay, zoned out and enjoyed it even more as a spectator. The Alan Watts lectures in particular are what take the game to a really special level. Will be downloading this. Seems bizarre and just up my alley. @MeloMan for better or for worse sums it up nicely. It looks like a main idea in this game is to just 'be' whatever the current circumstance. What I like most about this game is how no two playthroughs are alike. You start out as a random animal, be it a gorilla, or pengin, or zebra, or lord knows what else. An hour later, you're something much more abstract, like a quark, an oxygen particle, or fire extinguisher. Eventually, you gain the ability to add whatever you want from your established encylopedia, and create a wild scene of "stuff" dancing around in the ether. There is truly nothing quite like Everything. I love this sort of non-game experience. It’s so peaceful and deep. A good break from the chaos of Smash! I remember getting this game as apart of a steam sale at some point, for almost nothing. Can't say I've gotten any value out of it that I couldn't have gotten from just listening to some audio books on philosphy and staring at a trippy screensaver for an hour. I mean, nothing against those that like this sort of thing. But it just seems like a pretentious walking simulator, at best. Which is not something worth buying for 20 bucks, in my opinion. I would be tempted if the graphics were a bit better... it's kinda needed for a game of "walking around and exploring". Or is there really... Everything to see? This kind of visual expression is a huge part of David O'Reilly's whole "thing". It quite specifically mimics the look of his short film The Horse Raised by Spheres. For what it's worth, there's a lovely sense of scale and color coordination going on in this "game". Everything is considerably less conventional than GRIS if you ask me, by I won't argue against GRIS being a lot prettier, and also somewhat better in general, and more of a game.